Last week, Migos shared “MotorSport,” a revved-up showcase for Cardi B and Nicki Minaj. On the track, both guests are in top form—sharp, precise, and ruthless as ever. Sure, they sound competitive. That’s what happens when you get to play ball with a peer who’s on your level. But they never sound resentful. I only hear two vibrant personalities feeding off each other—even if they might not have been in the same room to record their verses. For some reason, some people want to turn this shared ambition into a beef. 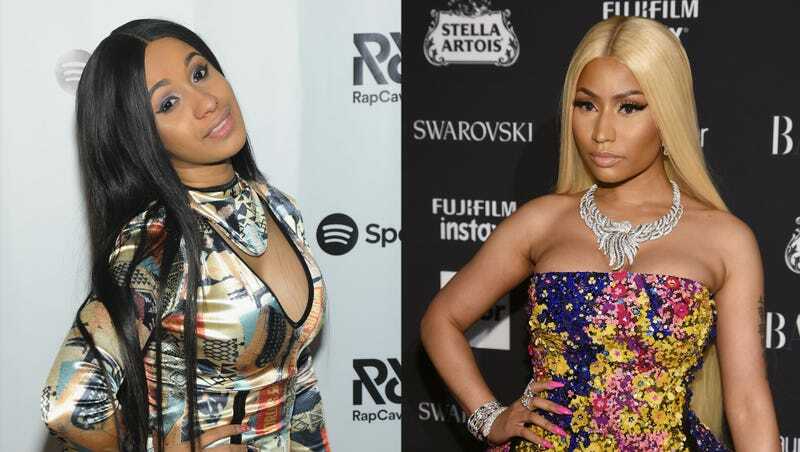 Rumors have been circulating that Cardi and Nicki they were dissing each other on the same track. This is a made-up tension that they’ve both publicly quashed now. “I was on the song w/Quavo. No one else was on it,” Nicki wrote on Twitter last night. “He called & asked if I think we should put Bardi on it, I said ‘ok let’s do it.’ The end.” Minaj continued by refuting the frankly wild assertion that she was unaware that Cardi was also on the track until its release. “Anything w/my name on it gets approved by me. It can’t even go on a streaming service w/o me hearing it & giving written approval,” she wrote. Complex also asked Cardi about the non-feud, and she said that even if she and Nicki made out on camera, people still wouldn’t believe they were civil. “I feel like people just want that drama just ‘cause it’s entertaining,” she said. Earlier this year, when Nicki and Remy Ma reignited their bloodletting, chart wizard Chris Molanphy investigated for Pitchfork whether or not the charts have ever supported more than one female rapper at a time. The results were troubling, revealing that listeners subconsciously pass along the crown every few years, instead of supporting a marketplace in which multiple female rappers can be successful at once. Of course, the blame can’t just be placed on consumers—label heads sign a paltry number of female rappers to begin with. But the public’s obsession with creating beef between two artists who’ve only taken vague subliminal shots at each other in the past only works to narrow the marketplace. Maybe instead of referring to Nicki and Cardi as the questionable “female rapper” tag, we should call them what they are: two of the most exciting voices in rap, period.